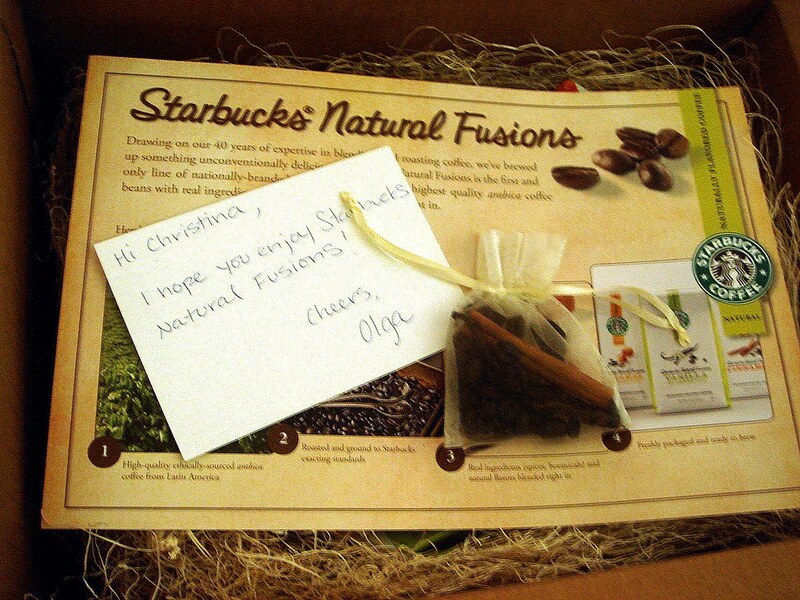 A while ago I received an email from Olga, a rep for Starbucks, asking me if I'd like to try Starbucks' new "natural fusions" coffee for review, and to host a giveaway. Due to my my ongoing interest in coffee, I felt it would be wrong to turn down the generous offer. Natural Fusions comes in three flavors, vanilla, caramel, and cinnamon. What sets these apart from other flavored coffees is that the natural flavorings (partly nondescript "natural flavorings", and also from real ingredients) are added to the beans as they're being roasted. The flavorings are also paired with different kinds of coffee and different roasts to enhance the flavor even more. Here's my lowdown on all three flavors. I brewed about 4 cups worth of coffee for each flavor, and uses 1 1/2 tablespoons grounds per cup. I also tried one cup black, and one cup with 1/2 teaspoon sugar and a little whole milk. In this coffee, they chose to use lightly roasted Latin American beans to allow the flavor of the vanilla to come through. The caramel particularly intrigued me because caramel isn't really natural, but more a combination of ingredients cooked together. 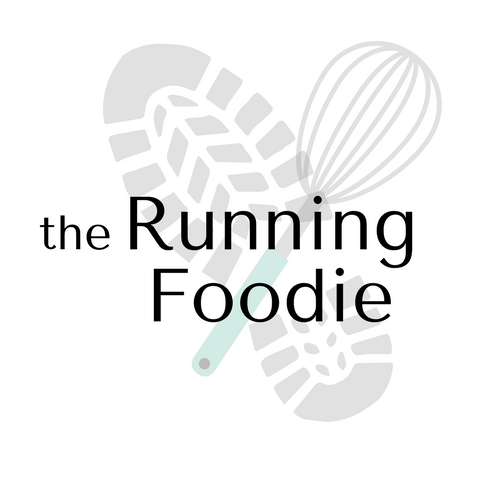 The ingredients used in this coffee are licorice root, dehydrated orange peel, ground cinnamon and ground nutmeg. This coffee, as well as the cinnamon, also uses Latin American beans, but here they are roasted dark instead of light. Caramel is a deeper, richer flavor, so it makes sense. As with the vanilla, this coffee stands alone when drunk black, though it tastes equally as good with the addition of sugar-cream, though the resulting flavor is more smooth and blended. When black, the flavors of the ingredients are sharper, and the caramel flavor is really rich and delicious. I figured the cinnamon would be the easiest flavor to do since it's literally just ground cinnamon sticks blended with the beans. Along with ground cinnamon, they also added dried orange peel, ground nutmeg, and Indian sarsaparilla root (which I think has a woody, deep flavor, and is a common ingredient in root beer). Firstly, as with the vanilla, you open the bag and this intense cinnamon scent just comes bursting out. And it definitely smelled natural, as if you just ground some cinnamon yourself. When brewed and drunk, it was almost like drinking a cup of coffee that you sprinkled ground cinnamon into -- it was that strong! The cinnamon had a warm tone here. What surprised me the most about these coffee was that none of them, especially the dark roasts, tasted over-roasted and bitter at all. These definitely would be worth picking up at the store. That's it! The contest ends on Tuesday (the 27th) of next week. Good luck! Ooh I'd love to be entered! I love coffee. Oh absolutely! I'm very interested in trying a starbucks that isn't over-done. 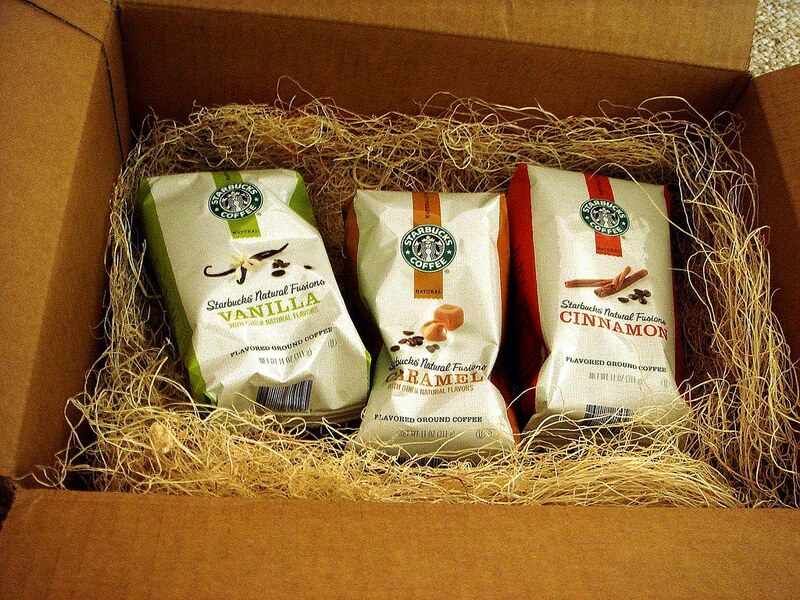 i'd love to try these coffees! yum!! Love coffee and would love to be entered. Also a fan of yours on facebook! Yum! I love coffee, I'd like to be entered. Thanks! Those flavorings sound lovely. I'd love to be entered. Thank you! OH MY GOSH I need this coffee.